Soft metal plaque with a duck swimming past reeds. Set into the lid of a plain black lacquer box. Engraved signature: Ikkokusai. Kajima Ikkokku II (1846-1925), who worked in Tōkyō, was the eldest son of Ikkoku I (c. 1820-1882) and was called the Mitsutaka until his father’s death, when he inherited the name. His gō was Ikkokusai. He won a Certificate of Merit at the Third National Industrial Exposition of 1890 and exhibited both at the St. Louis Exposition in 1904 and the Japan-British Exposition in 1910 where his work was illustrated in the catalogue, no. 199, a vase with nunome decoration, and no. 200, a double-fan-shaped incense box. 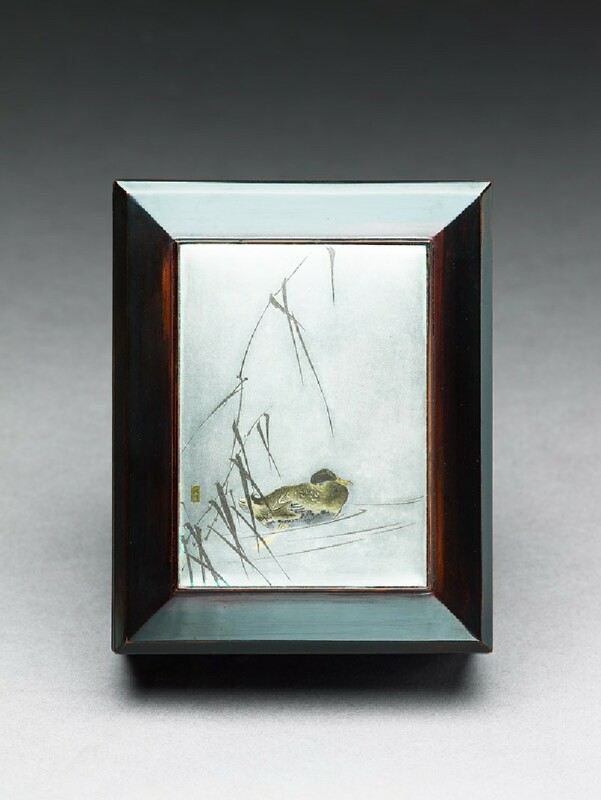 This miniature was purchased in Japan by Sir Herbert Ingram on his honeymoon in 1908, for 30 yen, as ‘box in metal design by Watanabe’. This refers to the artist Watanabe Seitei who supplied designs for several artists or companies, most notably the cloisonné company of Namikawa Sōsuke [see EA2000.50, EA1994.35 and EA1990.4]. The image here is quite consistent with his style, and even without the documentation, would have been attributed to Seitei. Ingram was a major benefactor of the Ashmolean and the high quality of his Japanese collections has been overshadowed by his remarkable Chinese collections, given in 1956.